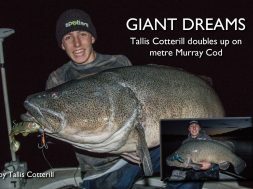 Cod Opening is an iconic day in the books of all Australian native anglers! It’s more exciting than Christmas and I know we all think it should be a national public holiday to allow everyone to go fishing! With a three month spell from angler’s offerings the fish have had time to rest, breed and prepare for the summer ahead. Since the last time we targeted them (in late winter) a lot has changed and your approach needs to be different. 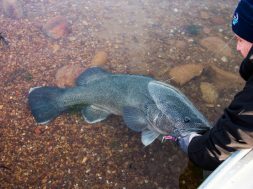 The cod will be feeding with an altered pattern and in different locations which means we need to adapt and figure out the best technique for the summer. At this time of year the heat begins to kick in with high 30 degree days even 40’s. This rapidly increases the water temperature which in return affects the behavior of the cod. 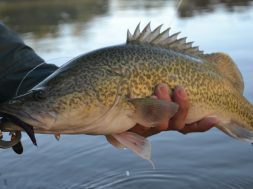 Murray Cod prefer warmer water and they become more active during the summer months. 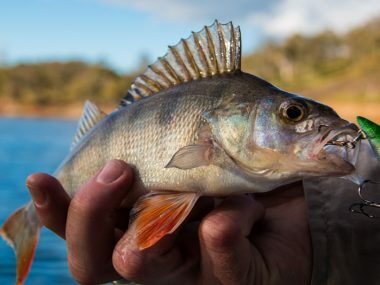 There is plenty of baitfish, crayfish, yabbies, shrimp and even bug activity on the water’s surface. This really switches the cod on and that’s why they become easier to catch during the summer months. December is one of the best months for cod fishing - the action is hot! In saying that there is a point in which the fish become uncomfortable with excessively high water temperatures and therefore they take refuge in cooler water. This cooler water is usually found deeper in the water column, in shaded areas and under nightfall. Once the water temperature peaks above 22-23 degrees the cod seek cooler water. Their ideal surrounding temperature throughout summer is between 18-21 degrees and this is closely related to the temperature of the water when they breed. Once the fish become comfortable with their surrounding water temperature they will begin to feed again, but they won’t venture into the excessive heat unless necessary. Let’s say you are fishing an impoundment during the day and your sounder is reading 26 degrees (this is normal for summer in most native impoundments). The water down four metres where the fish may be hiding will be cooler than 26 degrees and for this reason the fish will stay down deep. They will come up higher in the water column during the night, because the temperature will drop and it will become more comfortable for them to feed. 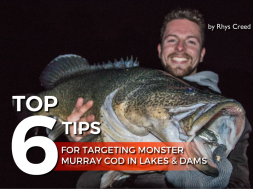 So when targeting Murray Cod in the impoundments and your sounder is reading in excess of 26 degrees, fish below 5m all the way down to around 9m and you will find the 7-8m mark will be the preferred depth for larger fish. So whether you’re casting or trolling this summer, concentrate your efforts on these depths. When fishing in Irrigation Rivers you will notice the temperature will stay around 20-21 degrees possibly even lower. Now it may be painful that the rivers are running high but it’s a good thing that the water temperature isn’t rocking through the roof. 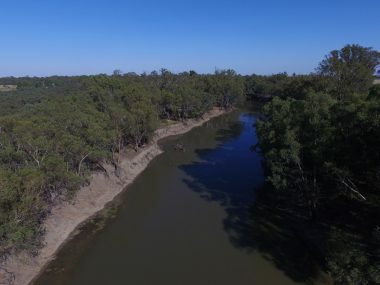 It means you can successfully catch good quality fish all summer because the cool water coming from the dams is keeping the water at optimum temperature. Therefore these fish will happily sit high in the water column against timber making for perfect bank fishing opportunities. 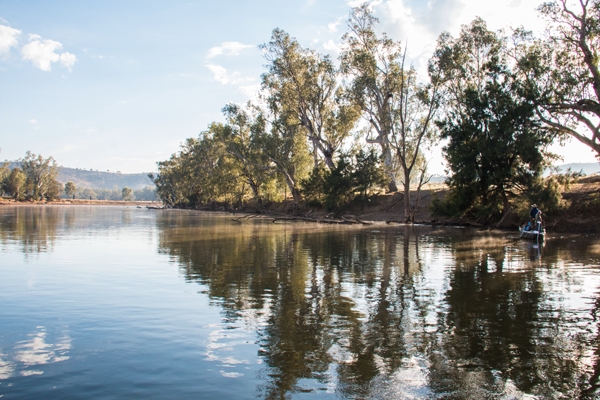 In saying that the water that’s close to the dam is very cold and therefore the fishing can create slow fishing conditions and on the opposite side of the river you have high water temperatures and extremely shut down fish. 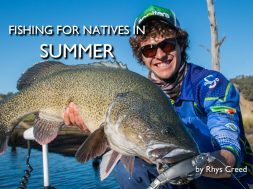 That’s just a quick simple run down on understanding water temperatures this summer and how they may help you catch more fish. 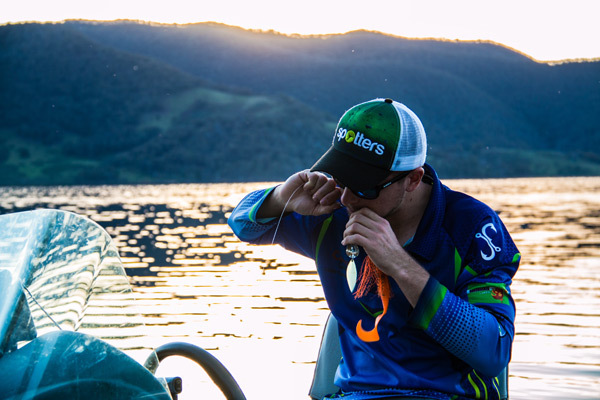 First and last light are the Holy Grail fishing situation for anglers. No matter what time of year they will always spark fish into a feeding mood. The reason for this is because the fish feel more confident because they cannot be seen by both larger prey and also the food they are hunting, this makes for an easier meal. When it comes to these low light periods in summer, they are even better! Firstly because of the above mentioned reason and also these periods are cooler, it provides the fish with a refuge from the intense summer heat. The cod will make the most of the moment to feed! Instead of wasting energy during the harsh heat of the day they spend a short period of time feeding in the cooler ends of each day. 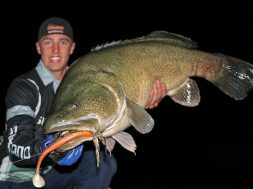 And this is why fishing during the night yields great success with Murray Cod, both in rivers and impoundments. Afternoon and Into Dark – the fish will be sitting deep as this is where they were holding during the heat of the day. As midnight approaches the water will begin to cool and some fish will slowly make their way up the water column into shallower water. Early Morning into Sunrise – the fish will be sitting shallower as the water temperature cooled off during the night. Therefore the fish will be sitting higher in the water column in the morning and this is for both rivers and impoundments. Already throughout this short article I have touched on the importance of depth and it’s because it’s a vital piece to the summer cod puzzle. During summer the cod will seek refuge in deeper water (like previously explained because of the cooler temperatures). This more so affects the larger fish as these high temperatures can really knock them around. In the rivers the larger fish will seek refuge in the deepest holes and sections of the river. This is where they will find cooler water and also a brilliant ambush location. Many large cod will live on a large piece if structure (usually timber) that sits close to, if not in a deep hole. Throughout the year this fish will move up and down the water column in against its log. When it’s extremely hungry or during the warmer months it will push up towards the surface. The big fish do this in winter to find warmer water. 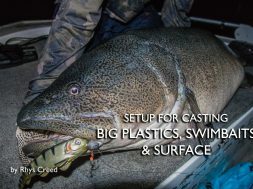 When summer comes around and the temperature pushes in excess of 23 degrees these large fish will take refuge down deep and this can make them hard to catch. This outside bank holds some deep holes which is where the big cod will hide out. 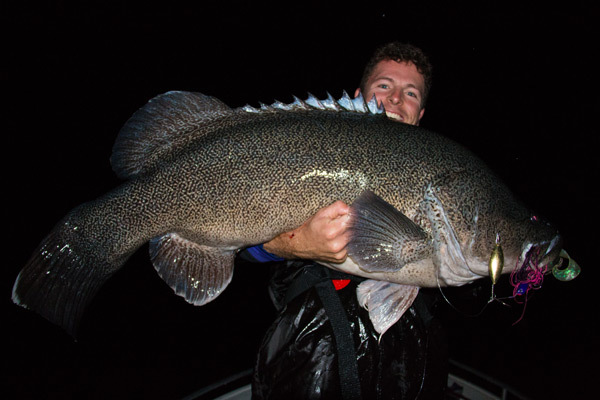 Trolling in one method which will bring these big cod unstuck, but there is another more exciting style of fishing…………. And that’s surface! You may be wondering how surface is a great technique when the fish are on the bottom. Well during the early hours of the morning chances are these fish will have lifted up from the bottom and will be activity swimming around mid-water column. If they are hungry enough they will be tempted to the surface with large presentations and all I can say is hold on! 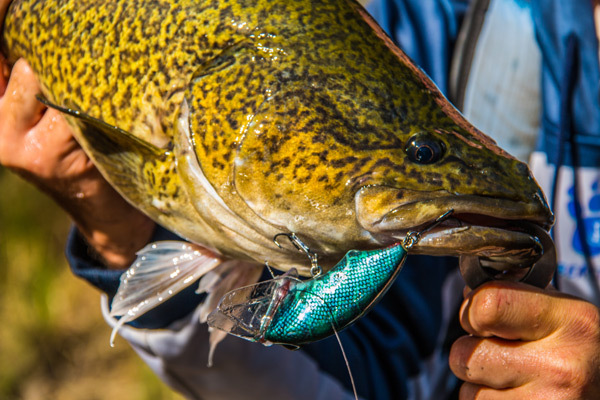 Surface fishing is one of the most exciting ways to catch Murray Cod - make sure you give it a go! Again the same principle applies, the fish will be sitting deep! But rather than sitting in the deepest hole available, they will be sitting along a bank at a specific depth range. Now this depth can vary depending on the water temperature, time of summer, heat of summer and also the location. Every waterway is different and there is no one set rule. I prefer to fish between 6-8m and I’ll always change it up on the night or day that I’m fishing. In saying that fishing from 4-9m is the range that we have caught fish and early in the morning before sunrise I really like to run the boat in a depth of 4m. I have yet to see many anglers who catch their fish in shallow but as the water cools overnight it’s not uncommon to see fish sitting in 4m of water. This is a prime example of a perfect bank to fish in summer. Its natural instinct when you are walking the bank to try and cast your lure out into the middle of the river. You always aim for that biggest cast or to catch the fish that’s the furthest away from you…. But with natives it’s not the case, especially during the summer months. In rivers with high irrigation flows the fish will push right to the edges and sit tight up against the banks under the shaded trees. Why? The first reason I believe they do this is to find the heavy shaded areas. Whenever you can find thick shade the water is always cooler and therefore the fish will be more comfortable. Second of all these fish still need to be in areas where there is current flow because they need to feed. So by sitting right in against the edge of the river, just off the flow it is a prime location to ambush passing food. Whereas out further along the snag that they usually hold on, the current will be too quick. Last of all the edges always hold swirling eddies and backwashes which are prime haunt for any fish species. Targeting these reverse currents will always have you in good chance of a fish. The best lures for fishing the high water is both spinnerbaits and hard body, and sometimes it comes down to your confidence lure. I prefer to cast spinnerbaits from a boat in against the bank and let it flutter down against the timber. Whereas Chris will prefer to walk the banks and run 80-100mm hard body lures in tight against the banks and piled up timber. 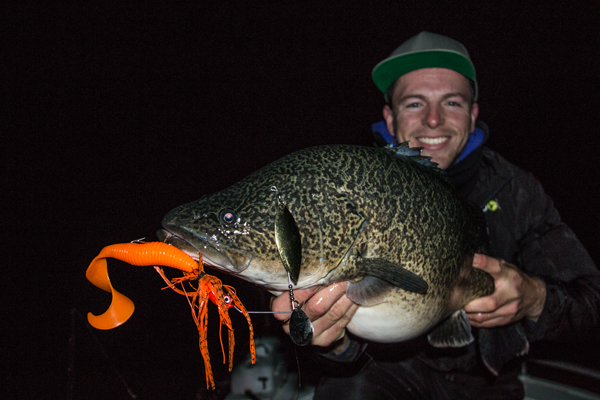 If you have never fished the surface for Murray Cod before than you are missing out! You need to give it a crack but word of warning, it’s not for the faint hearted. 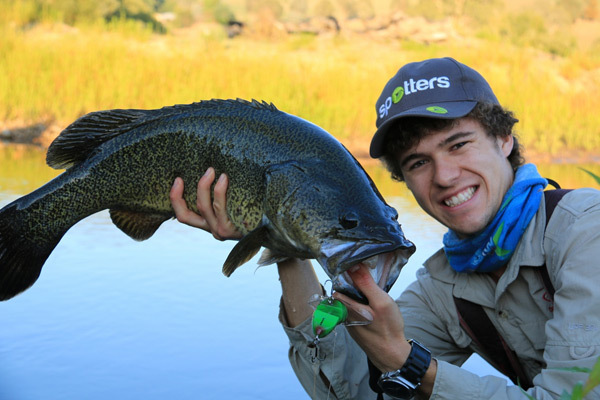 This style of fishing is not only exciting but can also be quite successful when it comes to action. During summer when the bugs are buzzing like wild, big moths, cicadas and mice everywhere the cod will be switched on to surface opportunities. This can make for a night full of action and we have more exciting nights on surface than we do sub surface, even if we only catch 2 fish. It’s because out of those 2 fish you might have in excess of 20 hits with 3 or more hits coming from the same fish! Best time of day is by far low light periods including night time but don’t be afraid to cast surface during the day, especially on overcast days. The author with a chunky small stream cod that smacked a Gobsmacked Surface Walker on first light. When using surface lures in rivers, try to concentrate on still pockets of water. You want to be fishing in areas where the fish will be actively hunting and already sitting high in the water column. Slow edges along the rivers in areas that are loaded with timber is always a big thumbs up! You can never have too much timber. In saying that you still need to be able to cast you lure without getting snagged – so you need to do your research during the day. 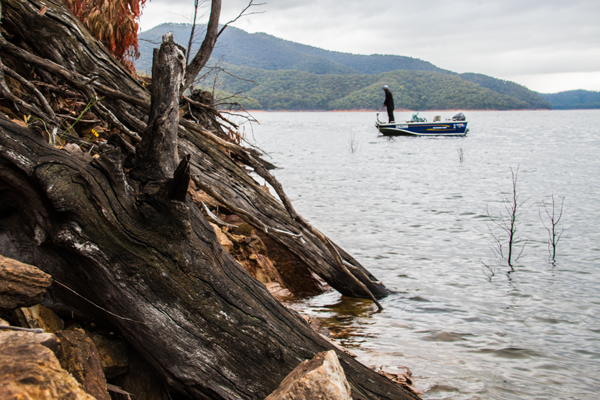 [This following tip is more relevant for night fishing] Look for areas that are loaded with timber… below the surface, with little structure breaking through. This means you will have a clear path when casting your surface lure in the dark, therefore not snagging and you’ll still be right in the zone. That’s just a handy hint to keep in mind. 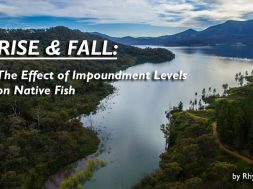 In the impoundments surface fishing can be a little different with more effort in between hits, especially in the deeper lakes and dams. Don’t be afraid to try all locations like; steep rocky banks, back of shallow bays, along timber lined banks, water inflows and around standing trees. Word of advice; try to fish in areas where there is surface activity. 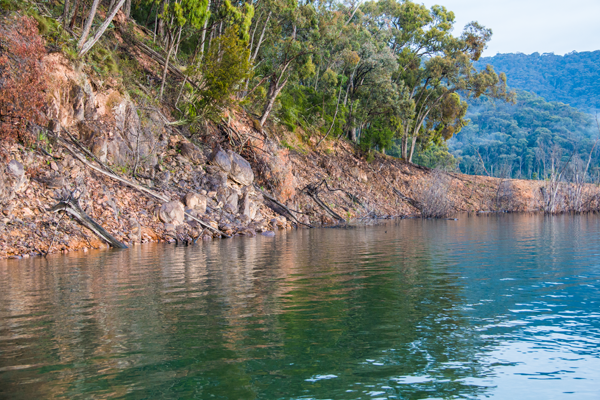 For example; in Burrinjuck Dam there is plenty of Water Dragons that run around on the rocks and fall into the water. A wake bait cast around the steep rocky banks is the perfect representation of a stranded lizard trying to get back to safety. 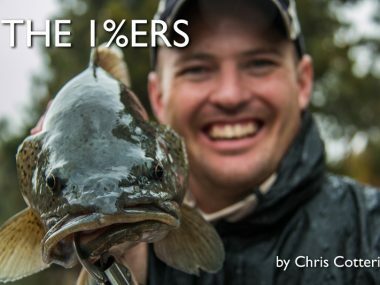 Last of all is a technique that isn’t used by many anglers but is becoming a go to for us. My fellow angler Jack loves this technique and is his go to, even before trolling. You will notice about 90% of anglers will troll during the summer months but this means they are only covering a specific section of water. The edge of the lake and the back of the bays are left virtually untouched during the night, but that’s where this technique comes in. 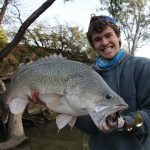 Jack and his PB 119cm Murray Cod taken before sunrise while casting a Mud Guts Big Guts spinnerbait! It is much easier to employ when you have a full lit moon but with the aid of sounder it can still be achieved on the darkest of night. It’s the same as during the day, hold the boat off the bank and cast diagonally forward to the bank, let the spinnerbait sink and roll it back to the boat. The only difference to doing it at night is you can fish shallower. Jack prefers to use bright fluro colours in the dark - and the Blowering cod just love them! 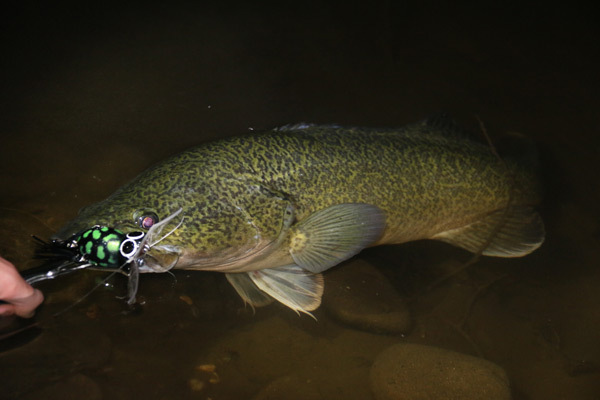 Targeting Murray Cod in summer is exciting and full of action! 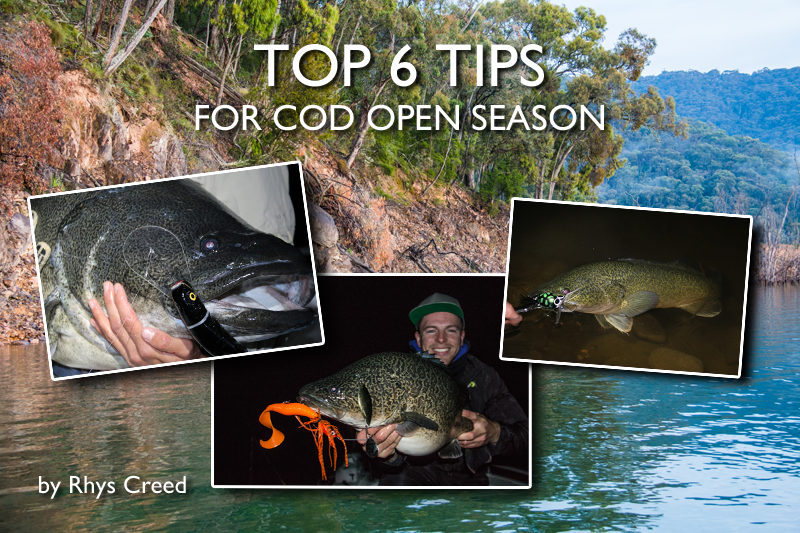 It’s a great time to be out on the water and by taking on board these few tips you’ll be in good stead for hooking into some quality Murray Cod. 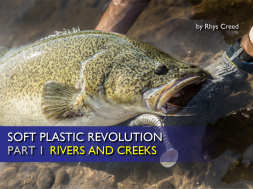 If you’re after more information and techniques for targeting Murray Cod in both impoundments and rivers make sure you check out the ‘Complete Guide – Lure Fishing Series’. Click the link below to find out more. 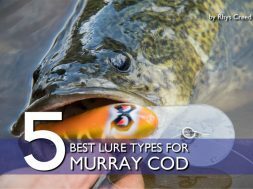 Learn more about the 'Complete Guide - Lure Fishing Series' here. 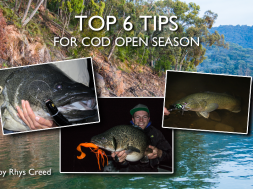 next Murray Cod on Surface: How to catch cod off the top!